LSU offers many sports other than just football. Some involve a track or a court, but one unique sport requires a broomstick. Quidditch was invented by British author J.K. Rowling in her Harry Potter book series. However, fans of the movie have taken this sport into their own hands— or, rather, feet—and made it come alive. 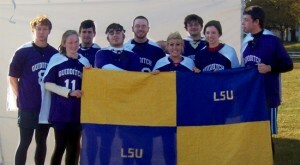 Last May, several students in the Honors College started an LSU Quidditch team. The original members were mainly Harry Potter fans, but the team has grown and includes a diverse crowd of about twenty members. Harry Potter and his teammates play Quidditch over an oval-shaped pitch—a field with very high seating since it’s an aerial sport. At each end of the field are three hooped goal posts, all standing at a different height. Each match includes a quaffle ball, two bludgers, and the golden snitch—a winged sphere that moves on its own. The quaffle is 12 inches in diameter and is passed between players. The bludgers are smaller in size and made of iron. Goals are scored when the quaffle is thrown into the opponent’s goal. Each team is made up of seven players: three chasers, two beaters, one keeper, and one seeker. In the series, Harry Potter serves as the seeker of his team. The seeker has one goal: to capture the snitch. Once the snitch is captured, the game is over. The LSU team hasn’t let the lack of flying broomsticks or a snitch stop them from a season of success, they’ve merely adapted to the muggle version—the game for non-wizards and witches. They run with broomsticks between their legs, but are still chasing after the snitch and heading toward the goals. The snitch is picked based on his endurance and ability to run fast—he or she dresses in yellow and has a long sock with a tennis ball inside it tucked into the back of his or her shorts. The seekers must pull the sock out of the waistband without knocking the snitch off his or her feet. Harless, a chemistry junior, has played on the team since the beginning and enjoys the spirit of the game. LSU isn’t the only university to show interest in the sport. The first intercollegiate Quidditch match was held at Middlebury College in October 2007. The sport took off around 2005 when students gathered on Sunday afternoons, making up rules from the book series. Now Middlebury, Vermont is the home of the Intercollegiate Quidditch World Cup Fall Festival, which featured 14 teams vying for first place this year—including LSU. “As big and eventful as the World Cup was, I feel that I can describe my experience in a few choice words: brutal, muddy, cold, and epic,” Harless said. LSU placed fourth in the World Cup after the students paid their own way to Vermont. Other college teams include Vassar College, Bucknell University, Oberlin, Whitman College, and Marlboro College. For LSU, the University of Louisiana at Lafayette is its biggest local rival. Harless describes the group at LSU as a club and a team because any University student is welcome to join the club. An active team member, however, must join the club and attend practices regularly. While muggle Quidditch teams are often associated with Harry Potter fans, the sport is gaining popularity with those unfamiliar to the series. Although Quidditch may look different from other sports, the team spirit puts it in line with all the others.